We always have stuffed artichokes and grilled artichokes to accompany the lamb for our Easter celebration. This recipe is a nice variation on the stuffed artichoke theme using roasted mushrooms and shallots along with breadcrumbs for the stuffing. It is very good. A friend recently mentioned that in her family the artichokes are placed under the broiler to crisp them up a bit after they have steamed. I am going to try that soon. Preheat oven to 400 degrees. Rinse mushrooms and pat dry with paper towels. Remove stems, then cut into pieces. Place cut mushrooms on baking sheet along with chopped shallots. Drizzle with olive oil then season with salt and pepper. It is optional to add a bit of onion powder and garlic powder. Roast for about 25 minutes, stirring occasionally until mushrooms are tender and the liquid has mostly evaporated. Let cool on rack. Place 6-8 cups cold water in a large bowl and squeeze the juice from the lemon quarters into the water. Add quarters into it, too. Rinse artichokes, then cut off stems, peeling and adding stems to lemon water. Cut off the top half-inch or so of each artichoke. Use scissors to cut off the prickly tips of the leaves (1/4 inch). Remove fuzzy choke with a spoon (this takes some work spreading open the artichoke). Place trimmed artichokes in the lemon water and let sit while you make the breadcrumb mixture. Chop finely the roasted mushroom and shallot mixture. Place in a large bowl. Chop up the artichoke stems and add to the mushrooms. Add to the mushrooms the breadcrumbs, garlic, cheese, parsley and a little salt and pepper. Mix well. Remove an artichoke from the water, drain a bit, then spread open the artichoke leaves slightly and sprinkle with some salt. Begin filling the leaves with the mushroom stuffing using a spoon. Use about 1/3 cup of breadcrumbs per artichoke. 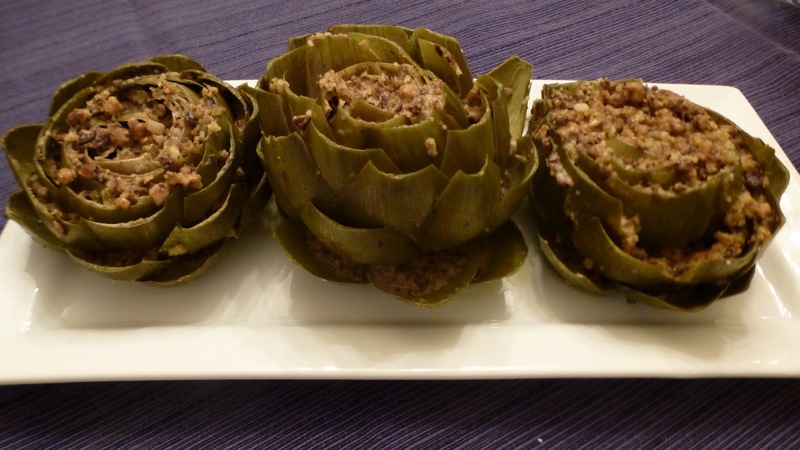 Drizzle artichoke with olive oil to moisten stuffing. Repeat with remaining artichokes. Fill a deep frying pan with one inch of water. Add artichokes. Cover and steam for 45 minutes to one hour (add more water if necessary) until tender when pierced with a fork. Serves 4 if leaving whole, or 8 if artichokes are halved. This entry was posted in Appetizers, Christmas, Easter, Thanksgiving, Vegetables, Vegetarian. Bookmark the permalink. Wow-this sounds awesome. We LOVE artichokes and mushrooms so I may have to try this one. Thanks for sharing!